making pretty looking things, and a engineering problem solving. It really is a dangerous combination, but when the outcome is a macaron that looks picture perfect and tastes just as good, it’s all worth it. Add to it that I’m usually making them for someone else, it makes it even more worth it. And there’s no way I could eat an entire batch by myself! Ok…well I could try but let’s be honest – that would not end well. 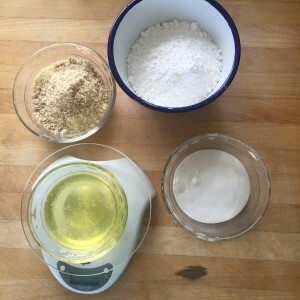 These 4 simple ingredients make up the macaron cookies – amazing! Sunday afternoon with a bottle of champagne on ice doesn’t hurt either. Just saying. I searched for a recipe that had everything measured out by weights and finally found a good one. Apparently it comes from Sur la Table.Thanks Sur! I also combined several techniques and steps from other recipes that I tried. So does that make it my own recipe now? In any case, back to the weights. It is SO worth getting a little kitchen scale for this. Oh, and all the other baking you’ll be doing after this. 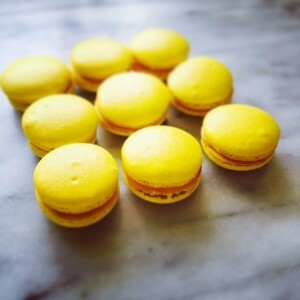 After all, you’ve mastered the macaron – nothing can be as challenging, can it?! Then you’ll need the kitchen scale for portion control to help on the diet you’ll need to go on after all the baked goods you’ve been making…and eating. 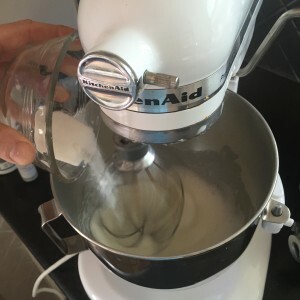 Place the egg whites in the bowl of stand mixer fitted with a whisk attachment. 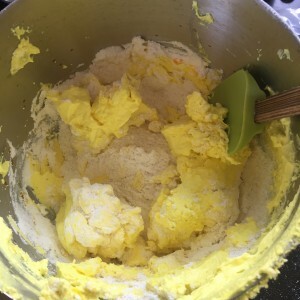 Beat the egg whites until they begin to foam, about 1 minute. 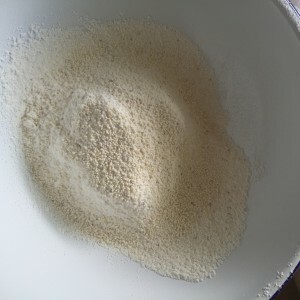 Slowly add the granulated sugar to the egg whites while the mixer is set on medium speed. Continue to whip the egg whites until stiff peaks have formed. The egg whites should be thick and glossy (you should be able to hold the bowl upside down without the whites falling out). 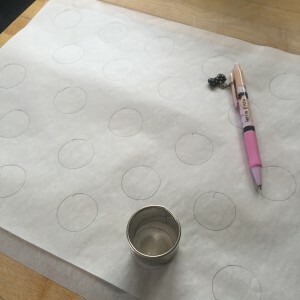 Transfer the mixture to a piping bag fitted with large round tip, and pipe small rounds onto a baking sheet lined with parchment paper with a template underneath. Top tip: put the bag in a large glass, vase, or something similar, and fold the edges down over the side. Way less messy… Another top tip: I trace 3/4″ circles on the parchment paper and then turn it upside down. When piping, I put the tip right in the middle stop right before I fill the circle, pulling quickly up right after I release pressure. The little peak should be small as possible and should disappear in the next step. Piped out and drying until a skin forms and doesn’t stick when you touch with your finger. 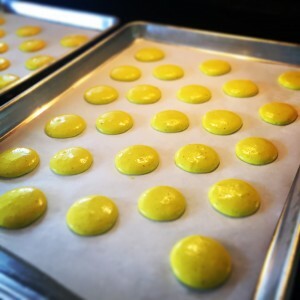 Gently tap the bottom of each sheet on work surface to release trapped air, then let the macarons dry for 30 minutes until a skin is formed on the surface. 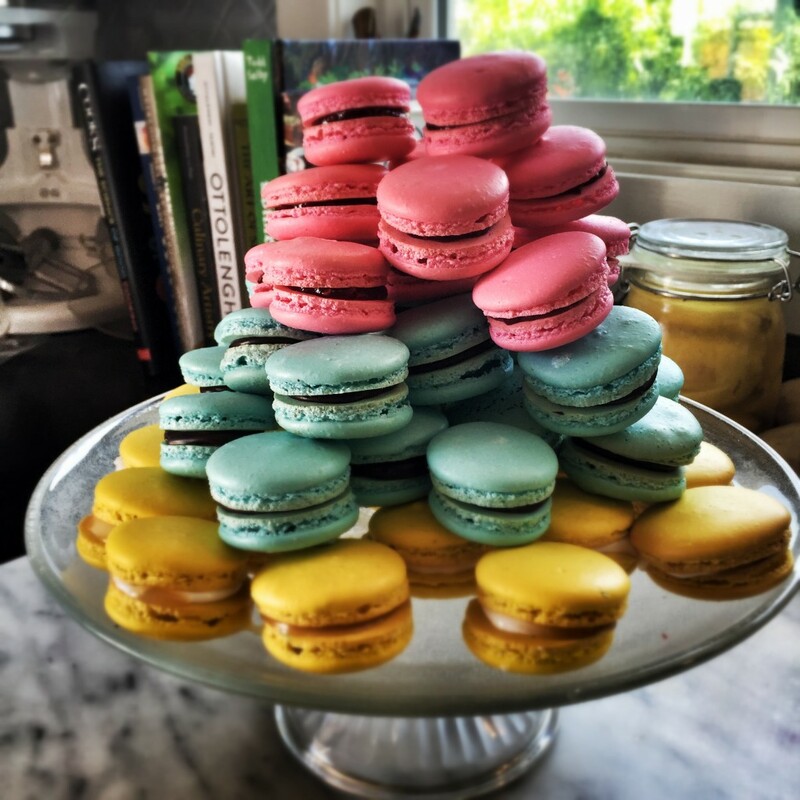 Place the macarons in a 300F oven and bake for about 10-12 minutes until the shells harden. Rotate the tray half way through. Let the macarons cool completely on the baking sheets. 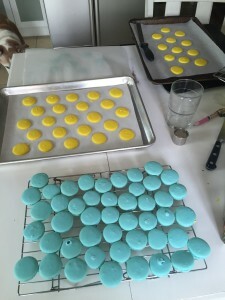 To assemble, match the macaron shells in pairs. Pipe a small round of lemon curd (about half a teaspoon) on the flat side of a macaron shell and sandwich together with a matching macaron shell. Repeat with the remaining macarons. * The assembled macarons can be stored in an airtight container in the refrigerator for up to one week. *Don’t age egg whites on the counter for three days, no matter what you read. That’s totally dangerous! Leave them in the fridge, covered and then bring them up to room temperature before using. Eat your heard out Ladurée, you fancy and $$ Parisian bakery! Ok yours are good, but I don’t live there… Lemon meringue, chocolate ganache, and raspberry fillings, from bottom to top. Look – you can even make them into a hat and wear them to serve at an Easter Bonnet Party!!! 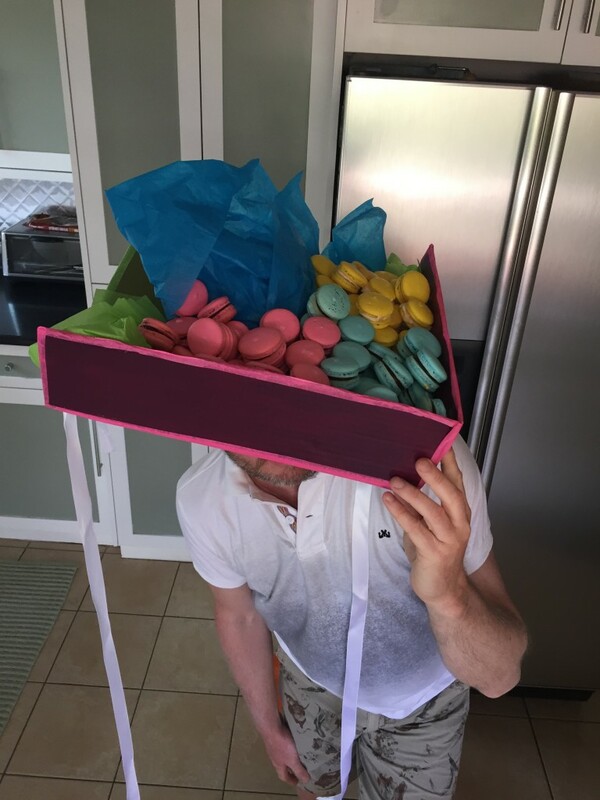 2 Responses to Mad for Macarons! Those were so excellent at the bonnet party. Every texture just excellent. I could go on about how the crust of the cookie was crisp yet yielding into the soft but not too soft interior but I won’t. You might not have had the biggest bonnet but yours wins for production value and realized effort.